Happy Feel Good Friday! Today I'm going to talk about the International Ocean Film Festival. Why? Because it's happening right now. 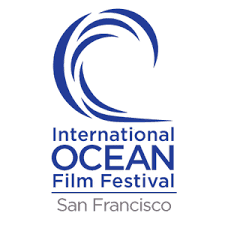 The International Ocean Film Festival (IOFF) is a nonprofit organization, "dedicated to using film as a medium to increase public awareness of the environmental, social, and cultural importance of marine ecosystems and foster a spirit of ocean stewardship." They've been doing this for the last 14 years by producing an annual film festival full of ocean-themed films that they hope "inspires people to appreciate and care for the ocean by revealing its wonders through independent films." The event is taking place in San Francisco now and runs through Sunday. You can watch the trailer for the festival here. If you live in the area, you can check out the schedule of films. They're also hosting four panel discussions which are open to the public and free to attend: Women in the Ocean, Sanctuary for Sharks, Plastic Pollution Solutions and How Technology Will Save the Ocean. IOFF also produces a Free Student Education Program which "presents film screenings for students and Q&A sessions with filmmakers, marine scientists, and industry experts." They will screen 11 films from the festival and a selection of the student competition films. Their vision is that more students are exposed to both environmental issues and documentary film.